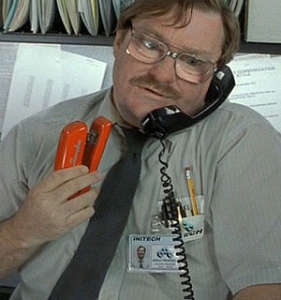 One of the best pieces of advice I got about leaving a job was to burn it to the ground because they took your red stapler be ready to go that instant if need be. If you feel compelled to give a notice, give them 2 weeks and be ready to go that minute. That obviously came true in my case, but the other shoe didn’t drop until a couple days later when I found out I wasn’t going to get paid up to my date of resignation. Luckily, I was in a position where I could start at OneCare earlier and I got to skip out of some boring meetings. In other words, if you know you’re going to be gone in like 2 months, don’t feel like you should be generous and let them know 2 months in advance. You might be gone that minute and have no pay for 2 months. End of public service message. I’ve worked at OneCare for about 5 days now out of the last 2 weeks. How would I describe it? Different yet the same. In many ways, the company is a smaller version of P&G. Still deals with WalMart, growing the business, and touching consumers more completely improving the lives of consumers. How’s it different? At P&G, we had technical team meetings where all the R&D and product supply functions would get together to catch up on email update each other on the project. If I were to hold that meeting at OneCare, I would be holding it with just me. There was one instance when I asked my marketing person what we should do about a consumer test, and she told me that was up to me! Also, at P&G, we would figure out how many levels we were to the CEO by looking ourselves up on the company directory and counting how many times we clicked on “Open Manager Profile” until we hit the CEO. When I left, I was 7 clicks. At OneCare, I’d be 2 clicks! I’ve had a couple days off where I’ve been able to nap a lot do some of my own stuff. That lifestyle is awesome. Some of the stuff I’ve been able to do are: Have breakfast at IHOP at 9 AM. Work at the College Hill Coffee House for a couple hours before meeting up with BBQ aficionado Nathan Moore at Goodies BBQ (more on that later). For those of you who really know me, you won’t be surprised that I plan my day around lunch. There are a couple of places I’d like to try, including lunch at Whole Foods Market, and some non-Starbucks type coffee shops to work from. If anyone has recommendations, I’d love to hear them! I’m sure you’re all wondering what “working on my own stuff” means. Basically, I’ve got nothing a million ideas, but I’m trying to narrow it down to 3 projects to focus on. I will share them soon! P.S. A lot of people have said they enjoyed the strikethroughs more than the actual content. I reapplied that idea from a Fantasy Football blog on Yahoo. And I’ve discovered that going back and doing the strikethroughs was more fun than actually writing the content too. I used to click to the CEO too. That is funny. I too love the strikethroughs. Keep them up. Next time you are in College Hill, let me know. Also, you might want to know that Montgomery Inn has all you can eat ribs today through Sunday. Just an FYI since you plan your day around lunch. Jeff, you’re on my lunch list! Thanks for the (rib) tip! big fan of the strikethroughs. :)interesting comparison to P&G in the atmosphere. I suspect that after my firm is more used to me and i to them i’ll be in the same boat of ‘karen decide this’. i look forward to it!